“Corporal Booth was one of my best pals. We went “over the top” on the morning of July 1st, like two brothers, and we had only got about 30 yards out when he was hit right through the temple. I had to leave him and got about another 150 yards when I was wounded. I spoke to him, but he never spoke”. 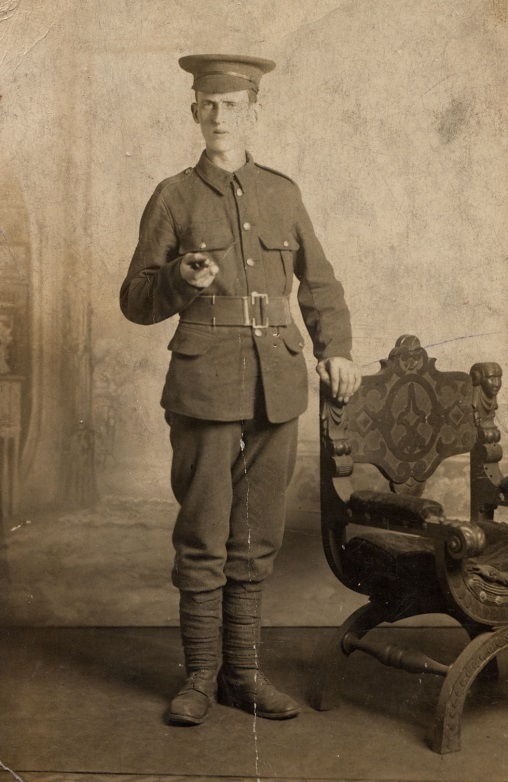 Booth – In loving memory of my dear husband, Lance Corporal Herbert Booth, who was Killed in Action, July 1st 1916. 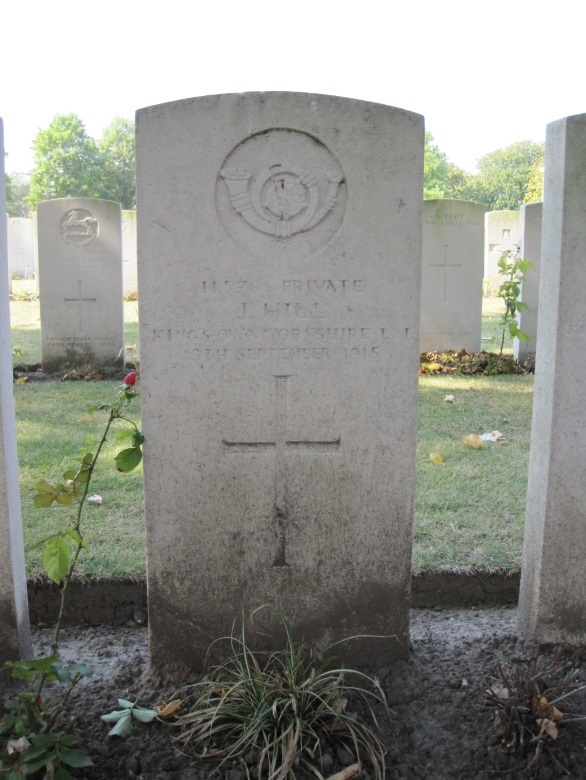 Booth – In loving remembrance of our dear brother, Lance-Corporal Herbert Booth, 9th Batt. KOYLI who was killed on the Somme, July 1st 1916. Brother of ours, you’re a man and a hero. 9th (Service) Battalion, The King’s Own (Yorkshire Light Infantry). 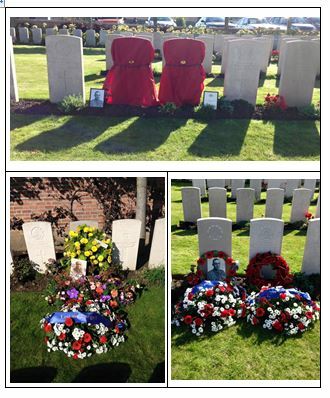 Last weekend I returned to Ypres. A visit I felt compelled to make. 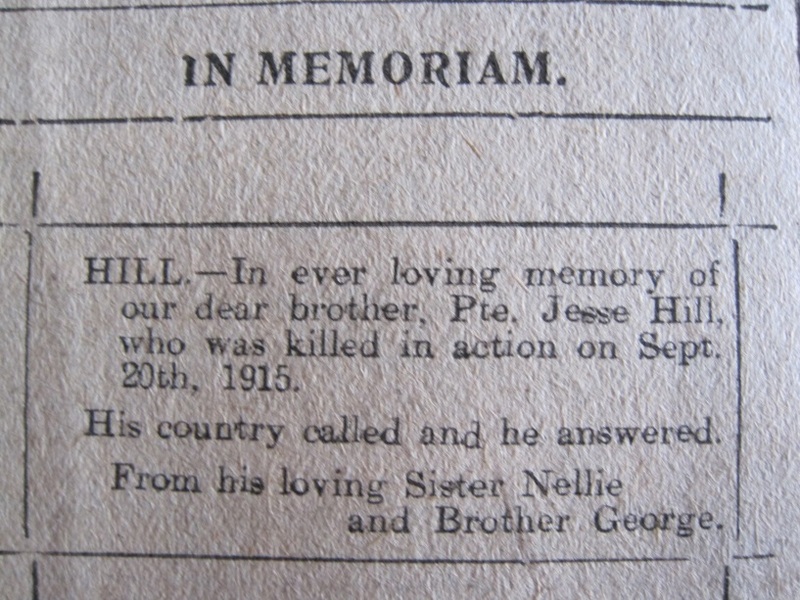 19 September marked the centenary of the death of my great grand uncle, Jesse Hill. 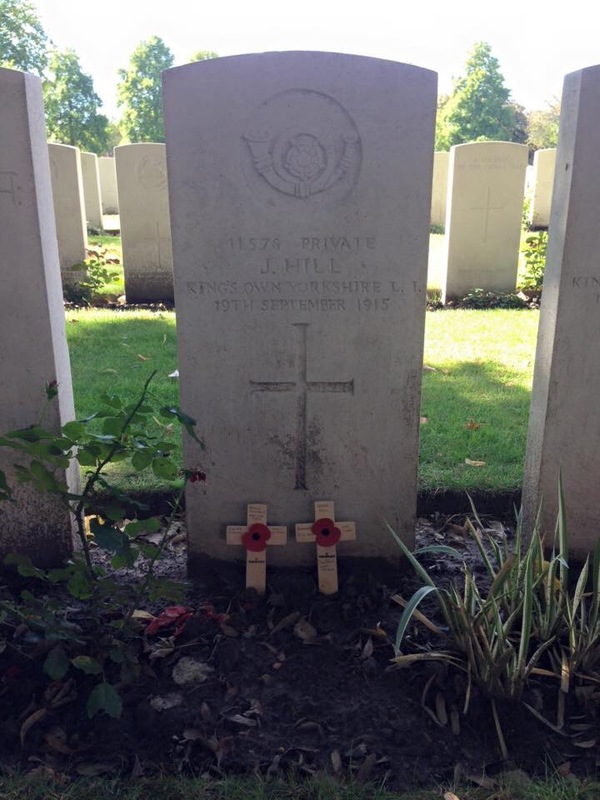 So it seemed appropriate to visit his grave in Ypres Reservoir Cemetery. It was a weekend full of coincidences. And an unforgettable one. 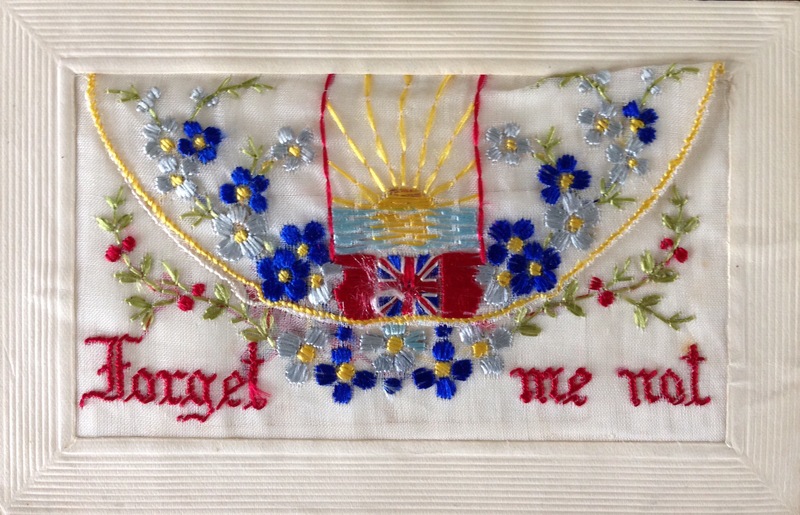 The events of 100 years ago still resonate emotionally with many today. I visited Jesse’s grave on Friday evening, the eve of the anniversary. The headstone is beneath trees and as a result every time I’ve visited it’s rather mud-splattered. Friday was no different. However when I returned first thing on Saturday morning, the anniversary of his death, the headstone had been cleaned! 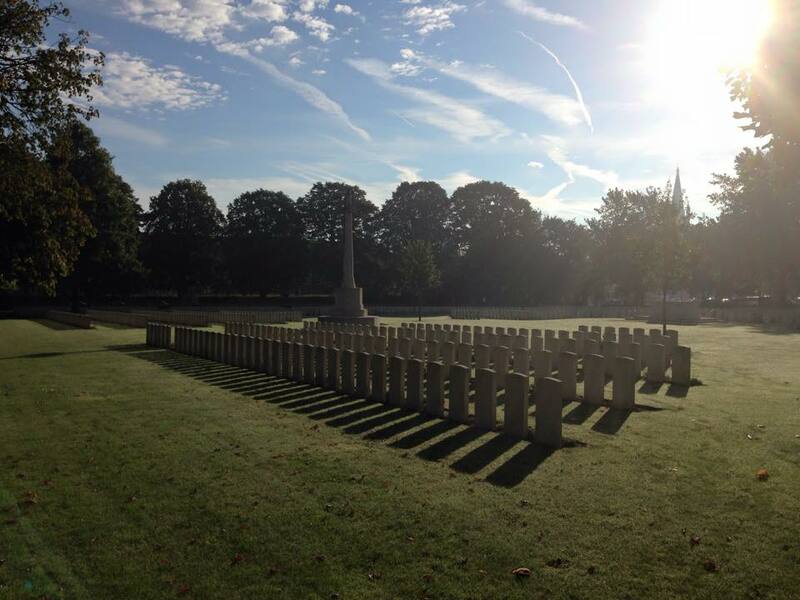 There was only one other person in the cemetery at 9.30 that morning – and it was someone I know from home! He was visiting the graves of Dewsbury men from 6th Battalion King’s Own Yorkshire Light Infantry (KOYLI), comrades of Jesse, who died at around the same time. So a huge coincidence that we’d both travelled 350 miles and turned up in that cemetery at the exact same time. 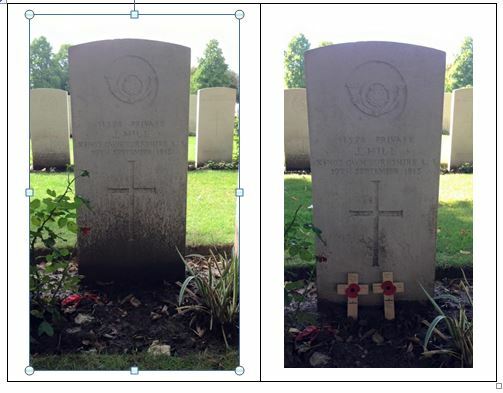 Before I left I placed a poppy cross, brought all the way from Batley, on Jesse’s grave. From Unit War Diary maps, I’d located the area occupied by the 6th KOYLI the morning Jesse died. 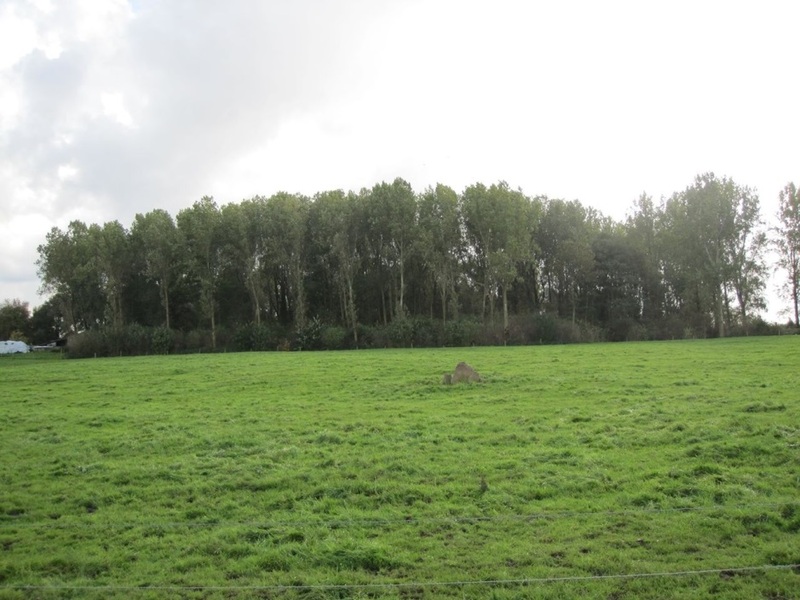 So on Saturday afternoon I walked around Railway Wood and what was the vicinity of the ‘H’ Sector trenches. Walking the ground brought home the frighteningly close proximity of the British Front Line to the German trenches in a way maps cannot. And it made the concept of “friendly fire” incidents far more understandable. On that walk my husband found two pieces of shrapnel. It’s not unusual, but then again in all my many visits it’s only happened to us on two previous occasions – so it did feel incredible that this find occurred on the 100th anniversary and in that very location. 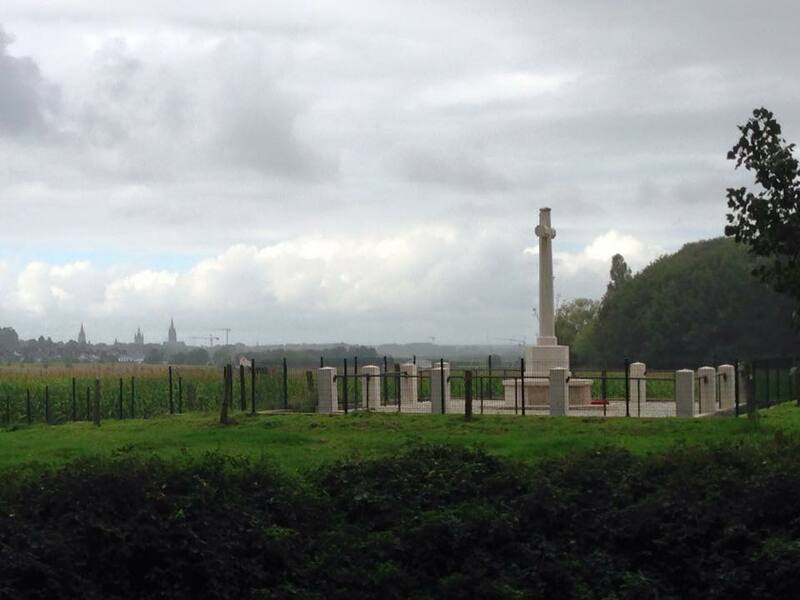 On Sunday morning I returned to Ypres Reservoir Cemetery. 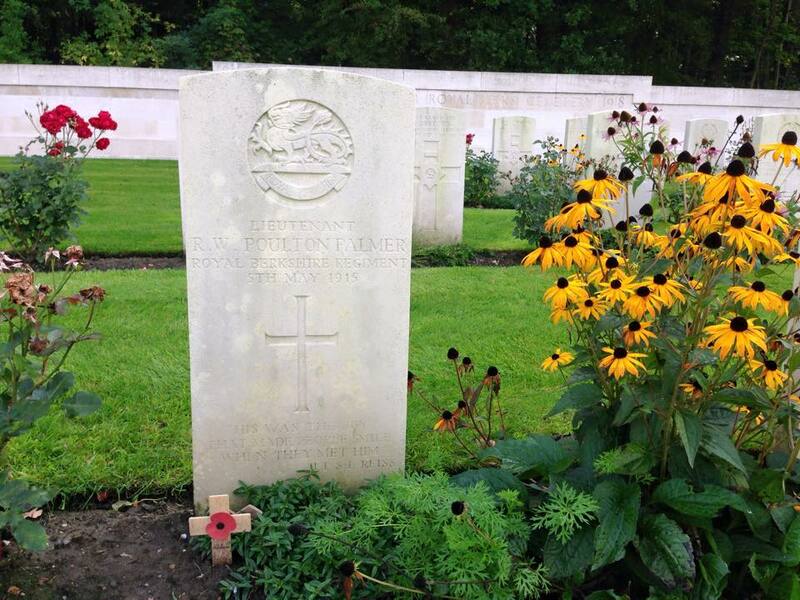 Unbelievably a second poppy cross lay on Jesse’s grave. A look I the visitor register confirmed that another Hill descendent also had the urge to pay an anniversary visit Jesse’s grave. Later that morning I attended a Rededication Service at Birr Cross Roads cemetery. Thanks to the patience, perseverance and unstinting efforts of Australian volunteer researchers, three soldiers’ headstones previously carrying the “unknown” epitaph now have identities; and the families of these three Australian soldiers, Pte Huntsman, Pte Eacott and Pte Neilson, now have named graves to visit. It speaks volumes of the emotional pull of the events so long ago that families of all three soldiers travelled halfway across the world to be at the service. It was a privilege to be there too. 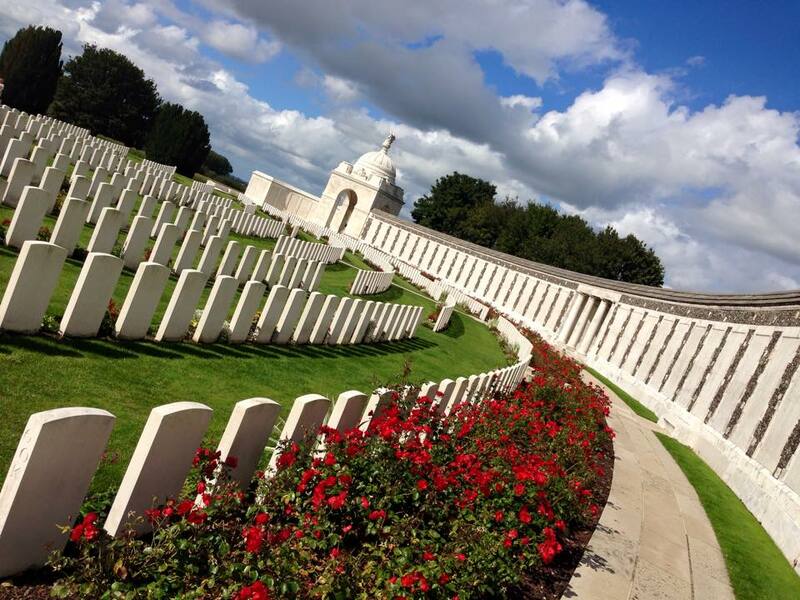 Other visits that day included Tyne Cot Cemetery and Memorial. The sheer size of the cemetery even after many visits is difficult to take in with 11,956 First World War servicemen buried or commemorated here, of which in excess of 8,000 are unidentified. The list of almost 35,000 names on the memorial is equally staggering. I returned home on Monday. On the way back to Calais I stopped off at the first CWGC site I ever visited: the majestic, lion-flanked Ploegsteert Memorial. Although I’m a Rugby League fan, as it’s the Rugby Union World Cup it seemed appropriate to pop across the road to call by the grave of England Rugby Union captain Ronald Poulton Palmer at Hyde Park Corner (Royal Berks) Cemetery. 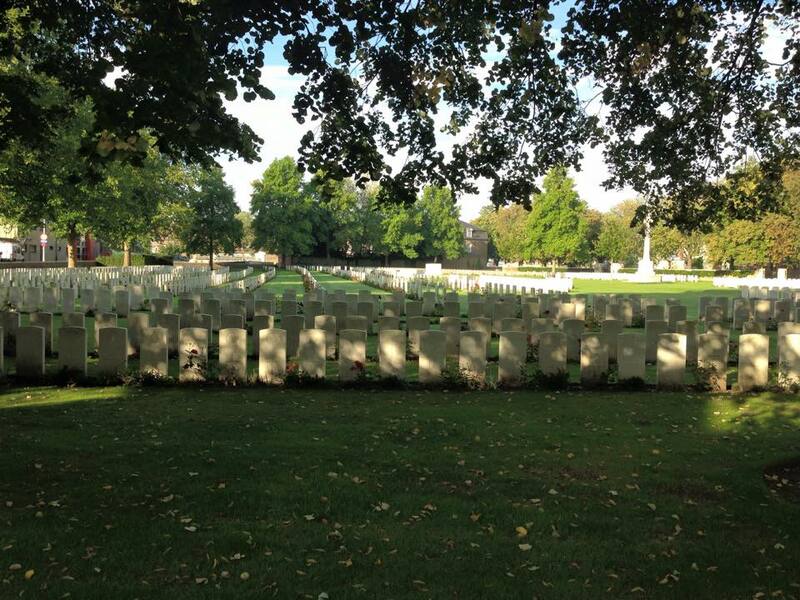 Final stop was Lijssenthoek Military Cemetery. I wanted to visit the graves of three men whose lives I researched and who have connections to my home Parish of Batley St Mary’s: John Collins, Henry Groa(r)k and Patrick Lyons. 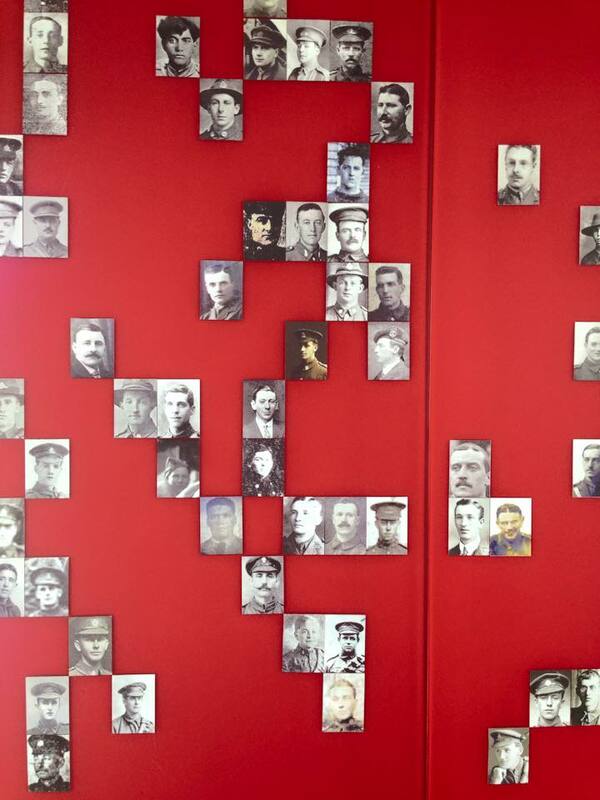 The cemetery has an excellent visitor centre with information about the soldiers buried there. I’ve supplied information about the St Mary’s men, and there is a webpage if others wish to do the same. There is also a wall containing some of their images. The first one I noticed was remarkably familiar – the photo of Patrick Lyons. It seemed a fitting end to my latest visit to Belgium.